Wüller's earlier works were based on rather serious themes but the title of this composition already shows that Wüller refers to a comic and bizarre subject: "Die blaue Elise" is a figure from a comic series and represents a blue anteater, who desperately tries to catch the ant "Charlie". The original Titel of this TV series is "the ant and the aardvark". The subtitle is an allusion to the "blue period" of Pablo Picasso. 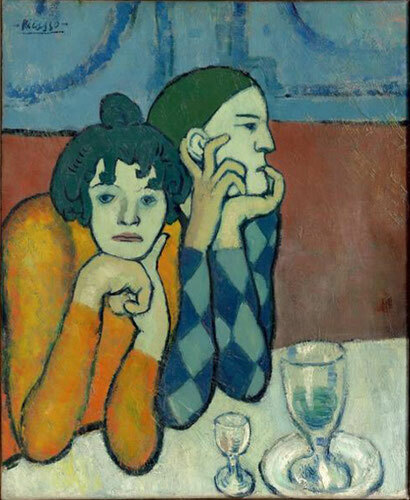 A series of blue paintings with gloomy and cold charisma painted by Picasso between 1901 and 1904. This influence forms an antipole and contrast to the main theme of the work. Similar to a comicbook, Wüller's composition often takes unusual twists. Wüller plays with the expectation of the listener, which he is always able to deceive. Equaling a picture story, exciting and funny elements alternate - e.g. soon after the beginning the music suddenly switches to a tango-phrase only to be replaced by a suspensful music that is loaded with sound effect just after only a few bars. Probably the most unusual element in this piece is undoubtedly the use of language and verbal expressions such as "harrumphs" or "coughing". Wüller remains faithful to his style: Like in many of his other compositions he chooses pictorial and symbolic themes, but this time he presents them with even more extreme means. A humorous adventure trip with some surprises.